The numbers are based on publicly available data on public assistance programs from 2007-2011. “Because pay is low and weekly work hours are limited, the families of more than half of the workers in the fast-food industry are unable to make ends meet,” the report said. Related: The real budgets of McDonald’s workers The data supports the claims that hundreds of fast food workers have been making across the country over the last year. Protests from New York City to Los Angeles, Memphis to Detroit have cropped up since last November , with workers calling for a minimum of $15 an hour and the right to organize without retaliation. The common narrative among fast food workers is that their pay is too low , they don’t get scheduled for enough hours and they get no benefits. The new report fuels their fire, finding that only 13% of fast food workers get health benefits from their employers, compared to 59% of the workforce on the whole. It also said that the median worker only works 30 hours per week, compared to 40 for the rest of the workforce. How I live on fast-food wages A separate report out Tuesday slammed fast food giants for pushing their workers onto the public safety net. The National Employment Law Project said that the 10 largest fast food companies in the U.S. were responsible for more than half the total cost to taxpayers — about $3.8 billion a year alone. The report calls out McDonald’s ( MCD , Fortune 500 ), Yum! Brands ( YUM , Fortune 500 ), Subway, Burger King ( BKW ), Wendy’s ( WEN ), Dunkin’ Donuts ( DNKN ), Dairy Queen, Little Caesar’s, Sonic ( SONC ) and Domino’s ( DPZ ). McDonald’s itself is responsible for $1.2 billion of that cost each year, NELP said. “The leading companies in the industry earn billions in profits each year, award chief executives generous compensation packages, and regularly distribute substantial amounts of money in the form of dividends and share buybacks,” the report said. Burger King Worldwide Inc did not respond to requests for comment. Wendy’s Co declined to comment, and Yum Brands Inc did not provide a comment. Such companies have long said that mostly young people do the entry-level work of flipping burgers or making milkshakes. The Employment Policies Institute, which has opposed calls for higher fast-food wages in the past, said in a statement that the NELP report “cooked the books to come up with its eye-catching numbers” and did not acknowledge that “nearly one-third of these ‘front-line’ workers are teenagers, or young adults living with their parents and attending school.” The NELP found that the median age of a fast-food worker was 28, Temple said. EPI also warned that workers would be worse-off if wages went up because employers would “replace employees with less-costly automated alternatives.” An anti-labor group called Worker Center Watch said the studies lacked credence because they were funded by Fast Food Forward, the labor group that helped organize worker protests. 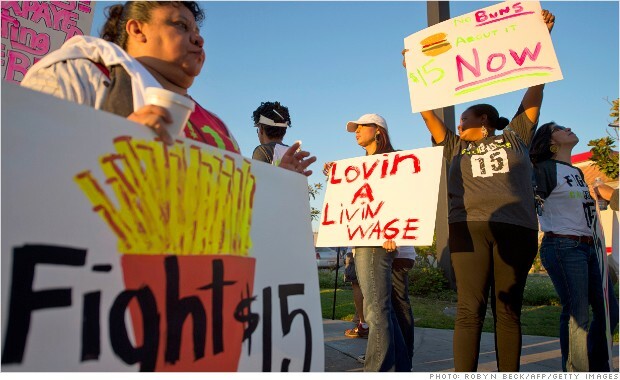 LOW-WAGE RUT U.C. Berkeley labor economist Sylvia Alegretto, who worked on the report from her school and the University of Illinois, said the economic recovery did not make life much easier for these workers, who are stuck in a low-wage rut. “They took it on the chin when the economy was bad, and now that it’s better, wages aren’t going up,” Alegretto said. “In fact, they’re making less than their counterparts were 50 years ago.” Alegretto said her team was “very conservative” in estimating the number of low-wage workers, counting only those who worked more than 10 hours a week for at least 27 weeks a year. The median wage for front-line fast-food workers is $8.94 per hour, according to the NELP’s analysis of government data. Many of these jobs are not full-time. Outage caused glitch for Walmart food stamps spree, Xerox says, but retailers have procedure for such problems. By Kathy Finn,Reuters / October 15, 2013 A California electronic benefit transfer card is seen in 2010 after a glitch made it impossible for some food stamps recipients in several states to use their cards. A new glitch this past Saturday allowed recipients a Walmart food stamps shopping spree at some of its Louisiana stores. Rich Pedroncelli/AP/File Enlarge NEW ORLEANS Wal-MartStores Inc and Xerox Corp blamed each other on Monday afterLouisianafood stamp recipients stripped bare the shelves of someWalmartstores when a computer glitch left their debit cards with no limits. The Christian Science Monitor Weekly Digital Edition Managers ofWalmartstores in the small,north Louisianatowns ofSpringhilland Mansfield alerted police on Saturday night that throngs of shoppers had flooded into the stores and were buying groceries using electronic benefit cards that contained no credit limits. EBT cards are debit-type cards issued under the state’s food stamp program and coded to show the amount of money available for individuals to spend. Food stamps are a federal government subsidy program for low-income people that is administered by the states. RECOMMENDED: Food stamps: How does the program work? When word got out Saturday that the EBT cards were showing no limits, card holders rushed to area Walmarts to take advantage. “Some people had eight or 10 shopping carts full of groceries,”Springhill PoliceChiefWill Lyndsaid on Monday. Xerox said on Saturday that its systems that process EBT transactions suffered an outage stemming from routine testing of backup generators that malfunctioned.Louisianawas one of 17 states affected by the outage. Kayla Whiting, a spokeswoman atWal-Mart’s Bentonville,Arkansas, headquarters, pointed to Xerox as the source of the problem and referred further questions to Xerox. Xerox corporate spokesmanBill McKeeprovided a written company statement saying that Xerox has a “documented process for retailers likeWal-Martto follow in response to EBT outages.” But the statement left unclear who would cover the unauthorized spending, and it referred further questions toWalmart.